Among all of the unlucky things like black crow, spilled salt, crossed knives, ominous footprints, black cat, bones, the number 13, snake eyes dice, broken mirror, skull, ripped umbrella, and a ladder, you have glowing things that will bring you luck, including pot of gold, lady bug, Ace of Spades, star, horseshoe, acorn, crossed fingers, rabbit’s foot, penny, four-leaf clover, turtle, wishbone, heart, and a leprechaun. 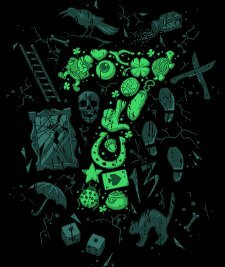 Get the Lucky Seven T Shirt and wear it when you have that feeling in your bones that it could be a very dark, gloomy night of the soul. The seven made of lucky things just might save you. One question to 604 Republic. Why is that eyeball lucky? I’m sure there is something I am missing, but I’ve been racking my brain for 92 minutes and can’t think of why an eyeball is lucky. Seems sorta unlucky, but again, I’m probably not sharp enough to get it.